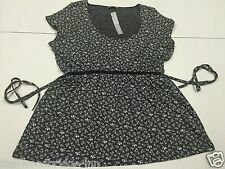 BODEN blue floral top size . 18 NEW . Scoop--neck with raw edge detail. colour blue floral. 100% viscose bottom half. length 24". material 100% cotton top half. Marks & Spencer Blue floral pattern short sleeve scoop neck top size 18. Condition is Used. Dispatched with Royal Mail 2nd Class. ITALIAN LAGENLOOK TUNIC TOP. ONE SIZE FITS 22 24 26 28. BUST UP TO APPROX 80" ALLOWING A FLOATY STYLE. OVERSIZED LOOSE STYLE. LENGTH FROM SHOULDER TO HEM 32". Fashionable exposed chunky zip at back of neck. Blouse 70% Cotton & 30% Nylon. Floral design lace top layer. Single layer lace sleeves. Lining 100% Polyester. Double layered lining body. Comfortable loose fitting style. White, blue & pink multicolour floral. Gathered front & waistband button detail. Having a good clearout due to weightloss. 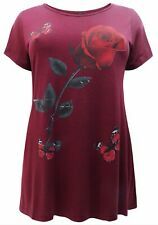 Dorothy Perkins Floral T Shirt Size 18. Pretty t shirt with lace detail around sleeve edge and hemline. In good used condition, from a pet and smoke free home. Uk postage only. No returns. Please pay within 48 hours of winning bid. A LINE SHAPE. SIZE 26-28. PERFECT CONDITION. Cotton rich material in an A line style. The sleeves are 3/4 length and it has 4 buttons that fasten below the scoop neckline. Ladies top size 18 Peacocks mint green/floral gypsy style - excellent condition! Ladies top size 18 Peacocks mint green/floral gypsy style - excellent condition!. Condition is Used. Dispatched with Royal Mail 2nd Class. ITALIAN LAGENLOOK LADIES TUNIC TOP. CUTE FLORAL PRINT WITH FRONT POCKET AND SHORT SLEEVE. ONE SIZE FITS SIZES 18 20 22 24. LENGTH FROM SHOULDER APPROX 29". MADE FROM COTTON. Striking stretch cotton top - Slip on and off with stretch - Long Sleeved. Joules pretty cotton top,18. Floral. Longsleeves. Worn once. Clean. VGC. Condition is Used. Dispatched with Royal Mail 2nd Class. TEXTURED TYPE OF OUTER FABRIC IN FLORAL PRINT. LENGTH FROM SHOULDER APPROX 27". Really lovely navy top with pink, orange and green flower pattern. Buttons all the way down the front. THIS IS A PRETTY WHITE COTTON JERSEY EMBROIDERED TOP FROM MARKS AND SPENCER IN A SIZE 18. IT HAS SHORT SLEEVES, SCOOP NECK WITH TIE AND KEYHOLE OPENING AND HAS BRIGHTLY COLOURED EMBROIDERED FLOWERS ON THE FRONT. Ladies excellent condition short sleeve top. Freshly laundered, ready to wear. Striking print top with contemporary floral print and weird fish embroidered logo. This top has been worn but is still in EXCELLENT CONDITION. 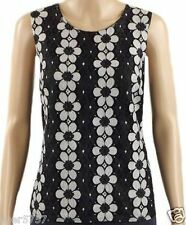 ITALIAN LAGENLOOK LADIES TUNIC TOP. ONE SIZE FITS SIZES 16 18 20 22 24. SHORT TURN UP SLEEVE AND FRONT POCKETS. LENGTH FROM SHOULDER TO FRONT APPROX 34". MADE IN ITALY. Pretty Ladies Long Sleeve Stretch Tunic Style Top by Tu,labelled size 22,poss more 20/22 but has stretch to the fabric. 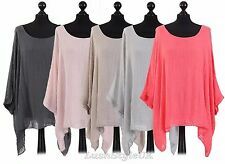 Pretty Stretchy Tunic top with scoop neck,Long sleeves,pull on style. New PLUS Italian Lagenlook Oversized FLORAL SHORT SLEEVES Sequins Top SCARF 62"